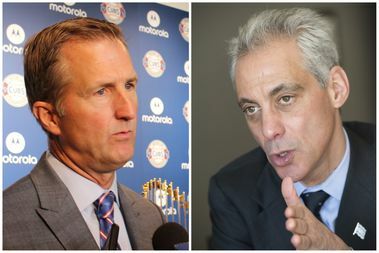 Crane Kenney [left] and Mayor Rahm Emanuel have been trading barbs through public comments over the number of night games allowed at Wrigley Field. CHICAGO — Mayor Rahm Emanuel Wednesday emphatically dismissed a request from Chicago Cubs officials for more night games at Wrigley Field, saying the team would not be “a good neighbor” to Wrigleyville residents. The team chose to schedule concerts — from which they keep all of the revenue — rather than additional night games for the World Series champions, Emanuel said. “They have to live with the consequences,” Emanuel said at a news conference after Wednesday’s City Council meeting. The Cubs fired back Wednesday afternoon. "Having to choose between a night game and a concert puts us at a firm disadvantage compared to other teams in Major League baseball and other venues in our city," said spokesman Julian Green. "It's like choosing between a foul ball and a strike. No matter which one you pick, they both count against you when you're trying to marshal resources to compete against 29 other teams." Crane Kenney, the Cubs president of business operations, said in an interview Monday on WSCR-AM 670 "The Score" that he wanted the team to have 54 night games, the average of all Major League teams. Right now, the team is limited to 47 night events — games and concerts. Ald. Tom Tunney (44th), whose ward includes Wrigley Field, also showed no interest in renegotiating the most recent night ordinance, which was last updated in 2013 to allow the Cubs 35 night games, four concerts and up to eight additional night games to allow for TV broadcast needs. "The ordinance governing evening activities inside Wrigley Field was negotiated by the Cubs, the community, myself and the mayor's office and has another seven years before it expires," Tunney said. "The Cubs have chosen to schedule concerts instead of night games." This year, Wrigley Field is hosting 10 concerts, from June 29's Tom Petty and the Heartbreakers show to a weekend of Green Day, Lady Gaga and the Zac Brown Band Aug. 24-26. The city ordinance allows the Cubs to schedule concerts beyond its first four, but in place of allotted night games. But the Cubs said the millions of dollars the team has invested in the community — including a recent $1 million grant to add more police surveillance cameras around the North Side — and the additional $30 million in annual tax revenue as a result of the ongoing Wrigley Field renovations merit more give on the city's part. To the team, more night games means more revenue, which means they're better equipped to win another World Series championship, Green said. Emanuel and the Cubs have clashed in recent months over security in and around Wrigley Field, and the mayor addressed Kenney directly during the news conference. In June, city officials asked the Cubs to develop a plan to protect the thousands of fans drawn to Wrigley Field by the new Park at Wrigley plaza outside the storied ballpark. The Cubs and city officials have long been at odds over the plaza, which city law limits to ticket holders on game days and concerts at the ballpark. Cubs officials had hoped to "create a public park open to everyone year-round." In response to the city’s demands, the Cubs renewed their request for Addison and Clark to be closed on game days to protect fans, a move that Emanuel has resisted. Instead, the city has closed Addison and Clark only when officials deemed it necessary, like in response to the size of the crowds that gathered June 2-4 to see the Cubs take on the rival St. Louis Cardinals. Wrigley Field's first night game was in 1988, after decades of effort from the club to lift the ban originally set in place out of respect to the neighborhood that surrounds the ballpark and to honor the tradition of day games at Wrigley. The team was first allowed to schedule 18 night games per year, a number that has increased slowly over the past three decades.